Post WW II, when America and Soviet Russia divided Korea into north and south countries. Government in Seoul became a US vassal state, a fascist dictatorship. Initially it was headed by Washington’s installed puppet Syngman Rhee, a brutal despot. Other pro-Western leaders followed – political repression, corruption, and US subservience standard practice. For weeks, mass protests involving hundreds of thousands in Seoul and other cities demanded President Park Geun-hye resign for abusing her power, involving influencing-peddling, bribery and other offenses. She’s former general Park Chung-hee’s daughter, South Korea’s despotic president from 1961 until his 1979 assassination – thrust into power by a military coup, ruling with an iron fist. On Friday, South Korean MPs impeached Park Geun-hye by an overwhelming 234 – 56 margin, many of her own party members wanting her removed, making it likely she’ll be the nation’s first elected leader expelled from office in disgrace. South Korea’s Constitutional Court now must decide whether to uphold her impeachment, likely not ruling until well into next year. With her approval rating at 5% and overwhelming parliamentary disapproval, she’s now suspended as of Friday evening Seoul time, her duties assumed by Prime Minister Hwang Kyo-ahn on an interim basis until the Constitutional Court rules. Crowds celebrated, holding signs saying “Victory for the People.” Park’s single five-year term was set to end in February 2018. Once removed from office, a new election must be held in 60 days. US imperial tool Ban Ki-moon is one of the leading candidates to succeed her, ending his UN general-secretariat position on December 31. So far, he hasn’t officially announced his candidacy, likely awaiting an appropriate moment. Out of office, Park loses presidential immunity, making her vulnerable to prosecution for abuse of power, influence-peddling, bribery and other potential charges. Weeks of public anger erupted in mass protests for weeks, at times involving up to two million in Seoul and other cities, led to her downfall. 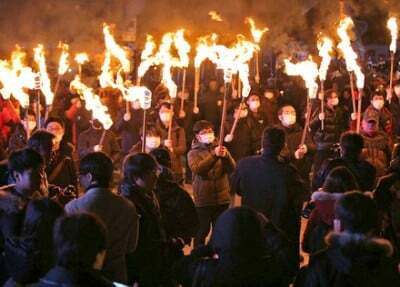 South Koreans wanted change and they’ll get it. Whether for better or worse remains to be seen. If they can do it, why not Americans. They’ve been far more deplorably treated, especially since the neoliberal 90s under the Bill and Hillary co-presidency, followed by post-9/11 war on humanity at home and abroad under Bush and Obama. (W)hen a long train of abuses and usurpations, pursuing invariably the same Object evinces a design to reduce them under absolute Despotism, (it’s the right of the people, it’s) their duty, to throw off such Government, and to provide new Guards for their future security. Straightaway as presidents, the Clintons, Bush and Obama violated their sacred trust, betraying their constituents, breaching all major promises made, institutionalizing tyranny, heading toward becoming full-blown if not challenged and stopped. What’s coming under Trump is unknown. His choices so far for cabinet positions and others in his administration aren’t encouraging. He also promised to get along with Vladimir Putin, cooperate with Russia in combating terrorism, end America’s regime change policy, kill TPP and other jobs-killing trade deals and seek a new role for NATO. If he delivers on these key pledges, his tenure will be historic. If he continues dirty business as usual, mass protests should demand his impeachment and removal from office – hard as it is to do, never successful in the history of the republic. There’s always a first time! When leadership violates its mandate, it loses its right to serve. Removal from office should follow as constitutionally permitted for “Treason, Bribery, or other Crimes and Misdemeanors (Article II, Section 4).